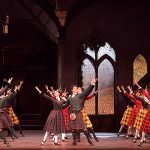 Tamara Rojo, English National Ballet’s artistic director, has said she wants to redress the gender in balance in contemporary ballet and to make certain there are more opportunities for women who have an interest in choreography. The triple bill has three female choreographers and includes Annabelle Lopez Ochoa’s impressionistic biog of Frida Kahlo, Stina Quagebeur’s adaptation of Henrik Ibsen’s The Doll’s House, and Pina Bausch’s brilliant version of Igor Stravinsky’s The Rite of Spring. It is an exciting experience. Annabelle Lopez Ochoa’s ballet to music by Peter Salem is based on Mexican artist Frida Kahlo (1907-1954) who is remembered chiefly for her self-portraits and her marriage to Diego Rivera. Kahlo, who suffered from polio as a child, nearly died in a bus crash as a teenager. She suffered multiple fractures of her spine, collarbone and ribs, a shattered pelvis, broken foot and dislocated shoulder. She began painting whilst recovering in a body cast. The 55 portraits make literal and symbolic references to her psychological torment and her physical pain. She had 30 operations. She suffered three miscarriages. Frida (Katja Khaniukova) is surrounded by Day of the Dead skeletons (a danse macabre) and the extravagant carnival figures with their brilliantly painted costumes and their bizarre headdresses. Eleven self-portraits figure on stage at the same time and they have a big and colourful impact. The ballet concentrates on Frida’s turbulent relationship with Diego Rivera (Irek Mukhamedov, burly in a fat suit) whom she married, divorced and married again. Nora famously walked out on her husband Torvald and their two children, slamming the door behind her. The sound reverberated round Europe in 1879, bringing Ibsen instant success and international fame. Nora has been a doll all her life. First she was her father’s plaything; then her husband’s. He fantasises about her being his secret mistress. She is his prize possession, his little squirrel, his skylark, his lovely little songbird. He thinks of her first and foremost as his wife and the mother of his children. The notion that Nora is first and foremost a human being never occurs to him. Stina Quagebeur opens with a prologue which should be cut. 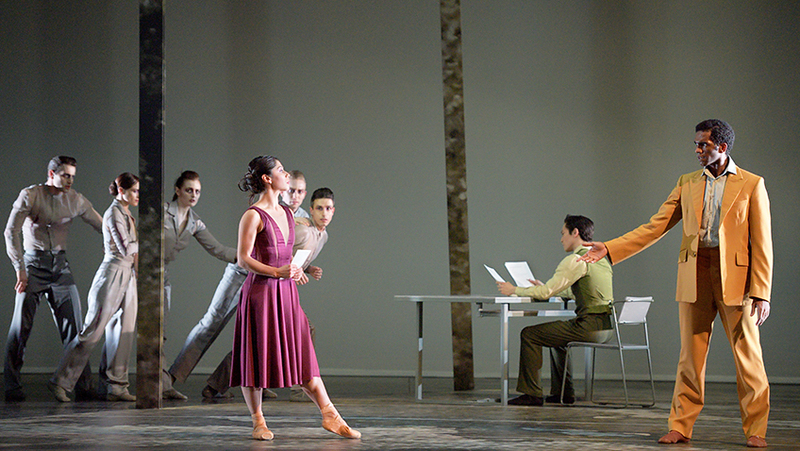 Nora’s inner conflict is conveyed by six dancers, five men and one woman, all in grey. The choreography to music by Philip Glass is always interesting; but had I not known in advance that I was seeing an adaptation of The Doll’s House, I don’t think I would have guessed. The major surprise is that there is no frantic tarantella, one of the most memorable moments in Ibsen’s play. The ballet’s dramatic high spot is Torvald (Jeffrey Cirio, excellent) losing his temper when he finds out Nora (Crystal Costa) has forged his signature. It must have been an unforgettable experience to have been at the Theatre des Champs-Elysees on the 29th May 1913 at the premiere of Stravinsky’s Le Sacre du printemps choreographed by Vaslav Nijinsky and danced by Serge Diaghilev’s Ballets Russes. The public was outraged. They made such a racket that the dancers couldn’t hear the music. Nijinsky stood on a chair in the wings shouting out numbers to keep the dancers on cue. The demonstrators howled, whistled, shouted abuse and slapped and punched each other. Since its premiere there have been well over a hundred different versions of The Rite of Spring. One of the great theatrical experiences is watching Pina Bausch’s, powerful, brutal, earthy scenario (premiered in 1975) matching the sheer visceral power of the music. The stage is covered in peat. There are two phalanxes, one male and one female. The vulnerable women wear slips. The rampant men are bare-chested and wear flared trousers. There is a lot of running around. The women leap on to the men’s shoulders. Who will be the first to lose her virginity? The frenzied rite requires exceptional stamina from the massed corps and soloist. Francesca Velicu is the vulnerable, frightened sacrificial virgin. Stravinsky’s barbaric rhythm has an unflagging and exhilarating ferocity. The turmoil leaves the audience as exhausted as the dancers.